Things Fall Apart ...we are acknowledging writers who have paved the way for Africans literature. In celebrating African-American month, one cannot read our history or understand our fights without looking at it through the eyes of some of our revolutionaries and authors. The role of a writer should not be underestimated. This writer`s role plays many function in educating about the responsibility of attaching human values through his or her work. The job of a novelist is to help people see dangers that normally would not have been brought to people’s attention. The ability for an African writer to see, feel, hear, and still maintain a peaceful composure should be admired by all people. Writing is a testimony as ‘Things Fall Apart’ taught us; if you did not document your work, and get credit for it, it never happened. The power of words cannot be ignored as poetry has become a bridge to the people’s hearts. The words in Achebe`s poetry have a way of connecting with the people as his other works showed .And as Rita Dove rightly said, “Every town needs it poet”. Achebe was born in the Village of Ogidi, a few miles from Onitsha in Nigeria. He became one of the first students to graduate from the University College Ibadan in 1953. Like many authors, Achebe was to study medicine but was attracted to the liberal arts which lead him to read English literature. As a visionary, he did so many good things that helped put him in a right path to success. His upbringing helped him; as he credited his early success to his Ibo community with a great leadership role. He benefited from the love and caring people in his community. His novel became a story with a universal appeal. According to Steven H. Gale, part of the value and appeal of this novel laid in Achebe detailing the everyday life of the nine villages in Nigeria, and Umofia in particular, in what would become the nation of Nigeria, in the days immediately before the coming of the white man (Gale). Talking about learning:Things Fall Apart’ exposes the danger, fear, and the resistance that civilization brought to the people of Nigeria. The novel focused its roots on the conflicts and tensions within the Ibo society; as well as, changes that were introduced by colonial rule and Christianity. Achebe had fun as he was narrating the resistance that followed it. As a learner, you can learn from others that life is not really what it seems. In Things Fall Apart, the main star of the story Okonkwo became a major character that brought honor to his community. He became a renowned macho man yet, his life according to the narrator was dominated by his “fear of failure and of weaknesses”. The book maintained its dignity yet was able to narrate a life of difficulties, pain, and sorrow that people went through. Through this book, readers understood what it means to live in fear. From reading, they saw that change was hard but it can also be a good thing if one gives it a chance. Adding values, Achebe spoke widely on what he considers to be the role of a writer and in particular, the responsibilities of an African writer. As a re-teller :One of the important aspects of Achebe`s book was the retelling of the story so that the younger generation could still see it as it was in those days. 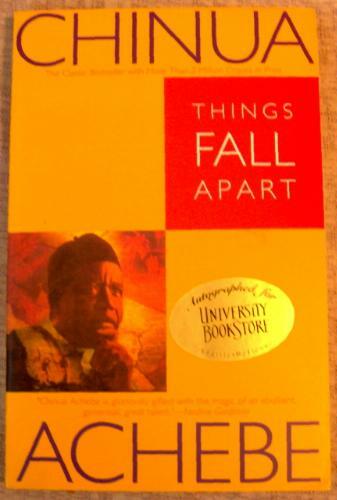 Life in Nigeria would have been different if not for the important lesson everyone learned from ‘Things Fall Apart.’ The book brought him fame, favor, and admiration from all over the world that he would not have had otherwise. The book reiterated the importance of embracing change, especially the ones we could not change. Through his book, most people realize that spoken words are different from writing. Most importantly,before’Things Fall Apart’, things were already complicated in Nigeria. For Achebe to have been so creative with that title within that period of turmoil portrayed everything. It meant so much to see how things began to unravel. Another role he bestowed on African writers is to educate. Every growing child needs good educators. They need good role models to help and guide them. But the task of educating his fellow Africans is a great challenge too as he later found out. But in all circumstances a writer should never lose his credibility and integrity. Another role expected from African writers is to maintain integrity. As a writer, it is easy to get caught up with what people want to hear. By doing so, one can mix up wrong facts and ideas which can also take a writer a way from honesty that writing requires. To Achebe, African writer has a role of maintaining integrity and trustworthy which is seen in the writing. My second blog was titled Our Lives As Readers. It was based on the things I read as a child in Africa. For those of you who read the blog that is where it all began; it brought back memories that a good book is supposed to. My own pains introduced me to literature early on in life. Probably poetry opened the door for me. In life, one cannot be a profound leader if one does not read books. In other words, how can you retell a story if you have not read one yourself? Or how can you write one if you do not read books yourself? One of the most important things anyone can do for children is to introduce them to books early on . It is so easy to get caught up in what is trending, things that those children may not need anyway. Without our leaders we will have no future and our duty now is to continue to aspire higher, and never settle from things that will not help us. It is with great honor to look at all the role models : Alice walker, W.E. B Du Bois, Maya Angelou , Anne Moody, Frederick Douglass, Langston Hughes and so many other writers that I could not name . We thank them for establishing the way for all of us. We have come to embrace them especially during this black history month. More pictures About African Americans.